Sup. Today I’m writing about the fifth track on the Fever Dreamer album, the song called This Road. This song dates back to before Control My Gravity. In other words, it was an idea that began well after Ever One, and before I committed to writing a new album. So when I finally decided to focus my efforts on a new album, it was an early contender which (in my experience) often means that it never actually ends up on the album. Often, when I decide that I want to write a new album, I create a note in Evernote with some track ideas to see if I have enough to get started with. The image to the left is the early tracklist for what ended up being Fever Dreamer. The note had a completely different album name. Something Like That is a phrase I say often at the end of recording my ideas into Ever Note. It's a crutch, so it made sense to name the album after it for lack of anything better! Out of that early track list, only two songs made it to the album: Savannah Dream Song (Beautiful Day for Life) and This Road. Anyway, long story short, This Road began as an idea that I decided to take one step beyond Ever Note. 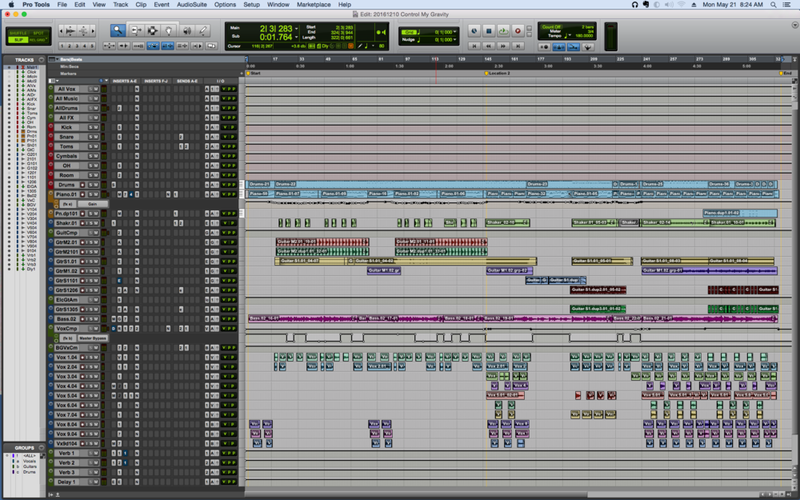 I loaded up Pro Tools in January of 2015 and laid out a very basic groundwork for the sound of the track. It’s MUCH slower than the final cut on the album. Flash forward two years and Fever Dreamer is already well under way. By this point, I had already established that I wanted a focused and consistent sound with the tracks on the album. As such, I decided to take another stab at This Road with a more fitting, ethereal and effects driven vocal chain. I was really trying to see which direction the song SHOULD go. I played around with a number of different tempos and over the course of 2-3 advanced attempts, landed on the faster tempo that made it to the album. By this point I figured the majority of the album was a bit drifty and slower moving, so I wanted a track to kind of break it up and move things forward a but more. I knew I wanted this track somewhere in the middle of the album to help lift up the listen so the entirety of the album wasn’t too heavy on all sides. Its also worth noting that I started work on this track in March of 2017. This Road was the last track that I created for the album. My original intention was to release the Kickstarter for Fever Dreamer in the Summer of 2017, but for a number of reasons (this track VERY MUCH SO included), it got pushed back toward Q4. This Road took a LOT of work to get it to the point where I felt comfortable enough with it to release on the album. I stuck with it, but I almost bailed a few times. Hello everyone! After three solid years of work, I’m happy to finally release my latest Yellowgold album unto the Internet! YES THREE YEARS. Let’s just say I’ve been really busy, but I’ll get to that in a moment. The new album. Seriously, you should get it! I thought I’d spend some time over the course of the next week or two pulling back the curtain, so to speak, on the album: Concept and approach of the album, as well as a song by song breakdown because (as you may or may not know) each song has a story! And by that I don’t necessarily mean the story told in the lyrics (although each song has that kind of story too). But I’m sure every musician will probably agree that writing a song usually comes from SOMEWHERE and often its not at all where you might think. To celebrate the launch of the album, though, I thought that today I’d write about the album concept as a whole, so here goes. After finishing Ever One in 2013 and receiving such positive feedback from that, I knew that I wanted to go back to the well and hit it again. I also knew I wanted to take a bit of a break. I’ll be honest: The way I write and record can be all consuming. I can go for days or weeks doing absolutely nothing but singing voice memos into Evernote (often on a daily basis… that in itself may sound overwhelming but nowadays, it’s such a part of my routine that I’ve amassed hundreds of song ideas and its growing without effort). And then at some point, I’ll get the urge to sit down at my DAW and start playing around with ideas. If I strike on something that inspires me, it becomes an obsession that I’m chasing and that happens AROUND everything else (Full Time podcast host at TWiT, Full Time dad and husband at home). All this to say that I was a bit burnt out after Ever One, but I knew I wanted to continue working on something at some point, and while I was waiting, I was just basically dropping ideas into Evernote. OK then. Then we bought a house. This is important for the sound of Fever Dreamer because it messed with my comfort level of production and writing. The recording dungeon at our rental. At our old rental in Petaluma, I literally had a separate (but tiny) office that I produced in. It had a door that I could close which allowed me to be less concerned about the noise I was making late at night and also let me live in the illusion of being on my own while writing, lowering inhibitions. Well, the new house that we bought DOES have a studio area… the Den where I have all my equipment, sound panels, and guitars hanging on the walls. I did my best to spruce it up and make it an inspiring environment in which to write late at night. The only problem is that the Den has no door to it. It’s open to the kitchen which is open to the stairs which is open to all three bedrooms. This means that I much more exposed while writing. So when it came time for me to start constructing ideas for a new album, I knew I would be writing the lions share of the music late at night AROUND everything else I do in life. And writing in an exposed room meant I felt like I needed to be quieter during recording than I was at our previous home. Everything at night would need to be done with headphones and contained within the DAW. Thankfully, audio technology is awesome and allows for that. But what I realize in retrospect is that limitation pushed me towards a sound where much of the vocals on the album are whispery and breathy. Being in headphones also brings your ears a bit closer to the subtle details of a soundscape, so I tended to be a bit more experimental with effects and layering. And I’d say the moral of this particular part of the story is that often limitations unlock new avenues of exploration. It would be easy for me to look at the open studio space, the late at night restrictions, and the fear of waking up my family and say “well, this won’t work.” Instead, I literally set out to see WHAT album I would write within those restrictions. As a result, much of Fever Dreamer is whispy, ethereal, effects laden, and not only that, it’s the sound of the entire album. That restriction enabled me to complete a song that followed a very specific and intentional theme in the way it sounds, a first for me to be honest. OK I’m rambling. And if it isn’t already obvious: These blog posts won’t be heavily edited. I’ll just dump this stuff out and move on cause I ain’t got time to edit. But I hope it’s informative. I REALLY love to read about how people approach their own creative processes and philosophies so I suppose I’m writing what I love to read. I hope you do to.